The Jewelry Information Center has just released its Spring Trends Report, highlighting what they’re seeing people wear. 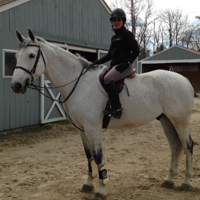 Earrings feature prominently this season, which is great news for fans of fine horse jewelry. The style of the moment is for button earrings – the small, petite, classy earrings that were so hot in the 1950’s and 1980’s. In the world of style, we know everything old becomes new again, and small is the new big. What does this mean for the lover of gold horse jewelry? We have two words for you: stirrup earrings. 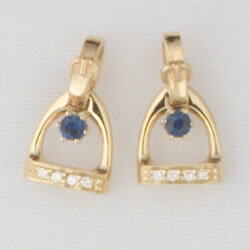 Check out these 14K Gold Stirrup Stud earrings with Sapphires and Diamonds. They’re beautiful, and you can wear them every day. They’re only 9/16″ (they look bigger in the picture, but that’s so you can see the detail) and are great to wear when you’re riding. Right now in the collection, we have ten different styles of stirrup earrings. You’ll find gold horse earrings there, as well as sterling silver horse earrings. There’s some great diamond horse jewelry. Another trend highlighted by the Jewelry Information Center is the cuff bracelet, especially sterling silver cuff bracelets. I know we’ve been telling you this for a while now, but the trend just won’t stop! In the picture you’ll see two of our favorite sterling silver horse cuff bracelets: the sterling silver wire cuff with a 14K gold horse and the sterling silver wide horse cuff with a 14K gold horse. 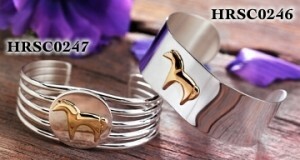 Both are proudly made in the USA and would be a great addition to your fine horse jewelry collection. To see all of the horse cuff bracelets we currently have in the collection, click here. There are 22 different styles to choose from!